Johann Christian Daniel von Schreber began publishing academic papers while he was still a student. He completed his studies in Uppsala under the supervision of the renowned researcher Carl von Linné. 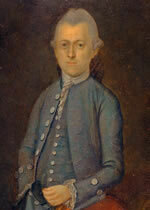 Schreber initially worked as a doctor and became a member of Leopoldina in 1763, later becoming its president in 1791. In 1770, Schreber came to Erlangen as a professor of pharmacology, botany, economics and administration, where he was also director of the botanical garden. During this time, the University received many artefacts from the natural world and works of art from the chamber of art in Ansbach. Schreber also devoted much of his time to translating Carl von Linné’s complete works into German. Schreber wrote the most comprehensive standard work on the study of mammals at the time, which remained unparalleled for many years. He is also regarded as one of the most important supporters of Linnean taxonomy in Germany, a system which is still used today to classify animal and plant species. Incidentally, the term ‘Schrebergarten’, German for ‘allotment’, owes its name to his nephew, the Leipzig-based doctor and teacher Daniel Gottlob Moritz Schreber.